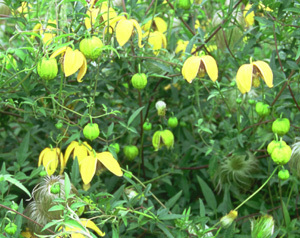 Joy Creek Photo Archive (c) all rights reserved The famous, if hard-to-get, Clematis 'Bill MacKenzie' boasts an abundance of 2.5-inch lantern flowers of bright yellow. The sepals are broad and fleshy and come to a slightly recurving tip. The striking stamens have red-brown filaments and brown anthers. Silky seed heads persist into winter. All of our Clematis are two year old plants that are suitable for immediate planting in your garden. June to October. To 20 ft.